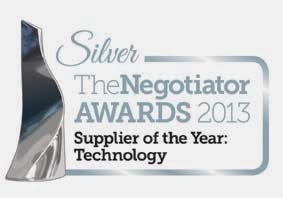 We are delighted to announce that Art Division scooped a Silver Award for Supplier of the Year (Technology) at the Negotiator Awards 2013. The property market is key to what Art Division do and we’ve been nurturing our relationships with our clients in the sector for years. So it’s fantastic to get some recognition at a prestigious event like this. We've even developed our own sister brand, Property Division, to really engage with new clients in the property market. The ceremony took place at the Hilton. What a lovely night, with some of the best steak we’ve ever tasted, and more estate agents than we’ve ever seen in a room together before! We saw our friends from Paramount Property (up for 2 awards), the lovely guys from Agency Express and of course the fabulous HomeExperts Twickenham. Well done to everyone and we hope you enjoyed the night as much as we did. Congratulations to the many other winners on the night – we look forward to working with more of you in the future.